Thanks to Diego Brawn for sharing his photos with us! Pictured in the photo of the Danny Gokey Band: Kevin Griffin, Miguel Perez, Maestro Lightford, Danny Gokey, Eric Ramey & Simon Yeh. Posted on February 28, 2018 by JanPosted in Discussion, PhotographsTagged Bernard Bell, Danny Gokey, Diego Brawn, Eric Ramey, Kevin Griffin, Maestro Lightford, Miguel Perez, Simon Yeh. Haven’t been around much in part because I have little to say. I went to see Danny on the Deep Hits tour and enjoyed it. I hope Danny has a bit of time to share with his family and unwind. But also hope he will direct his energy towards songwriting for the next project. Probably won’t be around much for the next month or two. Unexpectedly planning a trip to Germany with a friend. So much to do beforehand. Hi Ellen, the co-wrote of The Combeack was writing with Danny this week (I shared her Instagram post) So we know he is writing. It has also been Leyicet’s bday and I know he has family visiting from WI. So it sounds like a good break for Danny. Have a wonderful trip to Germany, Ellen. Would love to hear about it. It’s one of the places I’ve always wanted to visit. My great-grandmother was born there. Safe travels. Sorry, Jan. I was traveling for a week or so without much comms. I’ve changed the setting to 80 comments a page, see how that works? Hey Admin2, now that I’m trying to do only one discussion post a month, what do you think about the idea of letting 75 or 100 comments occur before we get the “Newer comments” button? Glad to see Masterpiece picking up a little pace. Will do, Cindy3. It’s really my friend’s trip. Germany wasn’t on my radar. Italy is. (My mother was Italian.) Neither of us has been to Germany, so not sure what we’ll see. I’m hoping Trier will be on the list. They have been in the video every time I’ve watched it. I assumed at first, there was something wrong with the video. I haven’t watched it much, because it sort of makes me have a headache. It has so many views, though, that I’ve started wondering if it is just my computer instead of a bad video. There was another video before that also bothered me because the audio was out of sync. I’ve forgotten which one that was. Hi Lurker, I get the prism-like outlines on Danny’s youTube video, too. I think it was intentional by the videographer, but I can understand why some may find it irritating. I do like the live action performance. Danny presented an award last night to the Bridge Ministry. I believe SHF has been supporting this religious charity. I don’t know about the movie, but I don’t like that version of the song. It annoys me. I had to shut it off. The original version of “I Can Only Imagine” is glorious. If it ain’t broke, don’t try to fix it. I didn’t watch the full video, either. The original is so emotional and sincere. But I’d imagine singing the same song for so long, Bart Millard does change it up. Danny does the same thing, but there are few times I don’t like Danny’s changes better…. 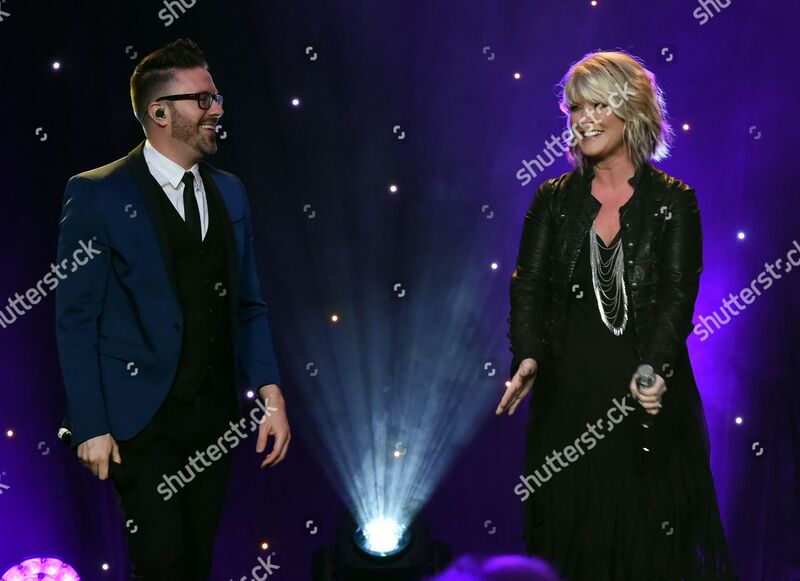 Danny was not only a presenter at the TJ Martell Honors Gala, he performed with scheduled performer Natalie Grant. Do you think they performed “The Prayer”? Great list of performers: Keith Urban, Thomas Rhett, Jeff Foxworthy, Lauren Alaina and I think Chris Young was a sponsor of the event. If my memory is correct, Danny actually performed for the TJ Martel Foundation way back in 2010…. The 11th Annual Best Cellars Dinner held at the Hutton Hotel in Nashville. Celebrity guests included Sara Buxton, Mike Diamond(Beastie Boys), Danny Gokey, Jewel, Big Kenny, Martina McBride, Whitney Duncan, Blake Shelton, Kellie Pickler, Phil Vassar, Luke Bryan, Deborah Allen and Big Kenny. The event is presented by Eco-Energy Inc. and benefits the T.J. Martell Foundation’s Frances W. Preston Labs at Vanderbilt Ingram Cancer Center. The Best Cellars Dinner is one of the Foundation’s signature events that is known for pairing Best Sellers (country music’s top selling artists and other celebrities) with Best Cellars (Nashville’s top wine collectors) plus an extraordinary gourmet meal prepared by a guest chef. The event has raised more than $1.5 million for the mission of funding ground-breaking cancer research. I think I’ll use this photo for a ThrowbackThursday post this week. It links Danny as a performer with Luke Bryan and Jewel! These are the kind of opportunities he had in country that prove my point that his first label contract was NOT a failure. 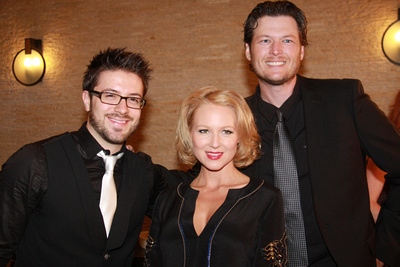 Also at this event was the head of Danny’s record label, Joe Gallante –who signed Danny after Idol to RCA Nashville. The departure of Joe is likely way Danny was not retained with his label. This was only a month after MBD was released. Support of Danny’s music got lost in the shuffle, I’m afraid. Wednesday’s (April 14, 2010) upheavals on Nashville’s Music Row were the biggest since the wave of label takeovers and mergers and layoffs began in the last century. Leaving will be longtime Sony Music Nashville chairman Joe Galante, the dean of Nashville record label rulers. Galante had been with the company for decades and built the Nashville division into a giant. Disappearing will be Lyric Street Records, to be shuttered by parent company Disney. Lyric Street was formed in 1997 by Randy Goodman, who had been Galante’s vice president at RCA for years. Galante began with RCA Records in New York in 1971 as a budget analyst, but soon turned out to be a music guy. He would go on to stay with the company until this week, running RCA’s national operations and then finding his true love in directing Nashville’s RCA label which — as Sony Music Nashville — also included the Arista, BNA and Columbia labels. His signings over the years ranged from Martina McBride to Wu-Tang Clan to Carrie Underwood to the Dave Matthews Band. I couldn’t agree more, Jan. I wish Danny would be more tactful when he discusses his country era. In some ways it was a good fit and in many other ways, it wasn’t. But he got a lot of tremendous experience — learned how to entertain as well as sing. And he made a lot of good contacts, got to see how the music biz operates, etc., etc. It was a great training ground. I am not sure his Christian career would have been as successful if he hadn’t had that grounding in the country music world first. Agreed! And would he be as well rounded, and thankful if he hadn’t struggled to get where he is today? The first year he had some awesome opportunities. Having the president of the label (that signed him) leave was losing a huge advocate. The missteps with IWNSGB and his last single, Second Hand Heart could have been avoided (IMO) and the outcome would have been so different. I agree, everyone. Danny’s country experience was NOT a failure. Loved his music. This is only my opinion.. I’m so happy for his success right now, but (at times) I felt more comfortable with his “country” music. I enjoyed his music and when he would sing other artists songs. Love his music now, too. BUT, miss his old music. Crystal Cove SP sounds lovely, Cindy. I truly enjoyed my short visit to Southern CA and I hope I can spend more time there sometime. I don’t know what to think about Danny’s single Masterpiece. It has broken into the Top 20 on the National C Airplay chart, but without a bullet. Its down 16 spins (again) on Mediabase, too. Not sure if the change of labels mean this song isn’t getting a push, or are they purposely giving it a slow start? Nice article about MercyMe’s Bart Millard and the difficult relationship he had with his dad and how long it took for his movie to be made. I may go see it after the holidays. Nice picture of his family. I think neither of these. My opinion is they have tried to push the song, but it isn’t as popular as some of the other songs have been. To me, it seems they have pushed it and pushed it and kept it on life support hoping it would go higher. I could be wrong. My opinion may be influenced by my not liking the song. I keep waiting for it to be gone and for another one to be out. But it is not showing much organic growth before they selected it as a single, unlike TYHTBA or IYAII. Hopefully we are both wrong. I’d like to see Danny with another hit. Southern California has a lot to offer. I might be partial, but I think ALL of California is beautiful. I’m fortunate to be able to live in the mountains, drive to the Mojave Desert for lunch, and enjoy a nice dinner at Laguna Beach, all in a few hours. That said… I think our United States is a Beautiful country to explore. I would love to visit all 50 states again, but this time really enjoy every state. We all are so very lucky. Lurker, I fear that if “Masterpiece” doesn’t do well, there won’t be another single from this album. They’d likely wait for the lead single from the next album. I don’t understand single selection. “Masterpiece” is one of the two songs I like the least on this album. The other is “The Comeback.” Not super-fond of “Symptoms” either. Everything else, I like. I wish they’d chosen a more-upbeat song, but maybe they didn’t want two in a row. Or I would have been fine with one of the duets.